This is Ferdinand, usually called Ferdie unless he is doing something he shouldn't! Having a puppy after fourteen years, and having got used to an old dog about the place, the idea of a giant puppy was a scary prospect. I had found the breeder on Champdogs and they had this one puppy left. He was older than one would normally choose to get a new puppy, because he had been operated on to have a hernia repaired. It was fate, as far as I was concerned, that they still had him waiting for me. This video was taken on the day I first saw him. That is my daughter, who insisted on coming with me. She was rather shocked at the size of the adult dogs. 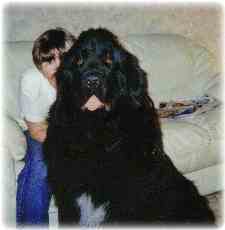 I did tell her it was a giant breed, but she always thought Sammy was big till she saw these newfies. Actually, I had only met one in real life, so to speak, but they are the sort of dogs that you just feel safe with. You don't feel any need to let them have a good sniff at you, they were just so enthusiastically friendly! Ferdie was just so sweet. He made himself at home as soon as he got in the house, by going around the coffee tables and licking out all the cups I had left there in my hurry to go and collect my new puppy. He still loves to get his tongue into a cup! The first time I took him for a walk, he got as far as next door and laid down. He wasn't going any further, lazy wotsit! As time went on, he would get on to the heath across the road, and lay down and refuse to move on the way back. I became quite famous, sitting on the grass waiting for this dog to decide to get up and follow me. I would take little bits of hot dog to tempt him to his feet, but as soon as he had eaten it, down he went again - he just did not want to go home! I was there so long one day that the lady who owns the cafe brought me out a cup of tea. I have even had to enlist the help of three little boys to run in front so that he chased after them! Luckily, I did not live far away, just across the road. One day, I realised that he never laid down when I had a friend with me. I had a different mindset then, I suppose, knowing that two of us could get him up, and I didn't expect him to do it. So next time, I just made my mind go blank and instead of thinking about him lying down, I carried on walking and he didn't lie down! He is a very stubborn dog, though, and if he decides he does not want to go somewhere, he will sit himself down and no one can shift him. Newfies seem to be easily frightened and once frightened, it is very difficult to cure them. We have a cornfield at the end of the road with a footpath around it, where I used to be able to let them off their leads. One day last year, Ferdie refused to go in there. Something spooked him in there, I don't know what, and now he will just sit down and pull back. Once I start walking out of the field, he races me along. I doubt I will ever change his mind.